Hehe great photo. A real superstar. Have a great day. 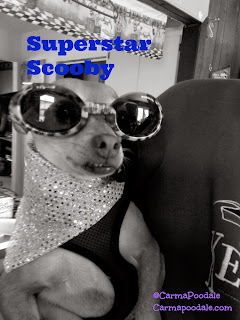 Scooby, you little rock star you! Well if you don't rock those glasses and that blingy scarf. If I saw you, I woulda thought you were a famous movie star dog! Haha--great shot :) Love how her lip is caught just a little in her teeth; makes her expression priceless. What a great look! Do you do pawtographs? What a dazzling combo of sunglasses and shimmery wrap! You look mah-velous! Bark More, Growl Less Barking from the Bayou! hahahaha very cool photo, have a great day. LOL, love it! Too cool for school.